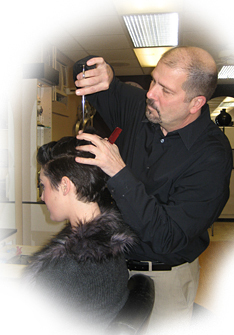 Joseph Panichelli has been a certified precision hair cutter for over 35 years. Joe has trained with artists such as Jay Sebring and Vidal Sassoon, and hair cutters from the USA to Britain. He has also competed in hair competitions and was first place winner of the Brandywine Hair Show and Precision Cutting competition. Our goal is to cater to all hair types and textures. The staff at Headlines has been lucky to be trained by Joe's experience as the industry has changed over the years, and he joins his team in keeping up with the trends. Joe continully furthers his and his staff's education, keeping the Headlines Team current in the beauty industry in all aspects of hair. As owner of his salon in Havertown, Joe Panichelli is here to make sure that everything about your visit is perfect. 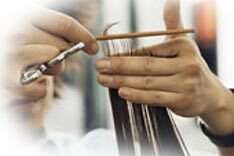 Your decision to visit Headlines Hair Design is a choice that we deeply appreciate. Joe constantly strives to deliver the best services and products available in the Havertown area. If there’s anything that Headlines Hair Design can do to improve your visit, just let Joe know. With 25 years as a licensed technician, Tina has worked at Headlines Hair Design since 1988. She specializes as a receptionist. Marisa graduated from Venus Beauty Academy where she won a contest for hair an makeup. She began her stylist career at Teased Hair Salon where she was educated in color and cutting in all facets from modern to vintage styles. She is also an experienced makeup artist. Marisa came to us with two year's experience eager to learn new techniques and continue her career as a stylist. Danielle is a graduate of Venus Beauty Academy. While studying to acquire her cosmetology licence Danielle also attended additional educational classes in several states. Upon graduating and becoming a licensed professional, Danielle was certified in multiple techniques such as Brazilian Blowouts, Japanese Yuko SStraightening System, Balayage, Ombré and corrective coloring. Her young enthusiastic personality gives her the eagerness to continue with growth in her career. Headlines would like to introduce you to the newest member of our Styling Staff. Dana is a highly experienced stylist with 38 years in the business. She is educated and knowlegeable in Rusk, Redken and Paul Mitchell color lines and products. Dana was looking to update her book and refresh her craft while keeping herself up-to-date with the latest styles/education classes. Dana will make the prefect addition to our Headlines Team.